The above article talks about a new ad campaign in NYC using in-your-face tactics to get folks to rethink their daily trip to the soda machine. As a registered dietitian, I think we need to start putting a bit of fear into the public about the health implications from our poor eating habits, such as the regular consumption of high sugar drinks. 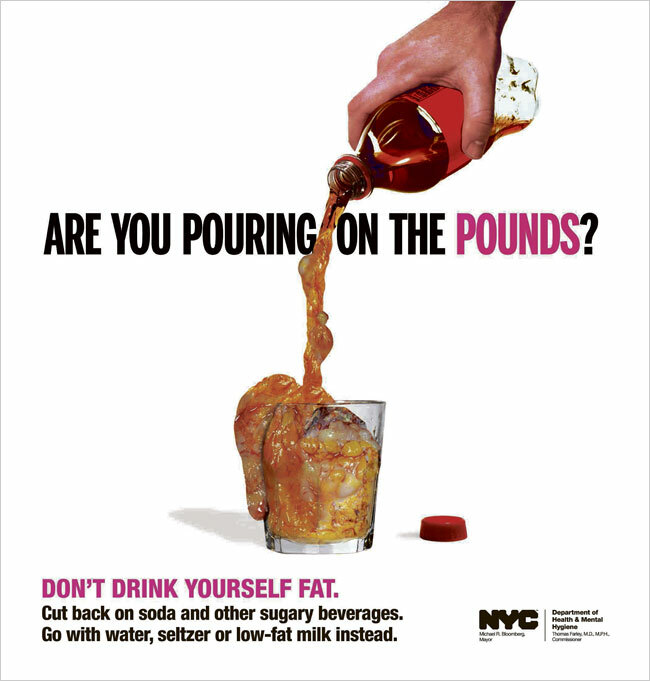 The new ad campaign shows human fat pouring out of a soda bottle. The ad questions, Are you pouring on the pounds?, and advises Don't drink yourself fat. After the city's department of health conducted focus groups on ad concepts, the fear of reality by images like this one made the most impact. I think scare tactics in advertising will be more effective than a tax on soda. The harsh reality of brutally honest images may force us to take a look in the mirror and stop being in denial of our horrendous eating habits. It is worth a try to start running more ads like these and measure the impact. In conjunction with scare tactics, health professionals need to constantly be educating the public. Many people do not even realize what they are eating and drinking. We know too much sugar is not good for the body. But do we know how much sugar is too much? And do we realize how much sugar we are ingesting with one, two, three or more cans of Coke per day? I say "bring it on" when it comes to these ads. Let's not "sugar-coat" the situation at hand and get real with ourselves. If we don't, we are just ignorantly killing our bodies slowly.